Choose a practical people-carrier with handling to rival the rest of the Mercedes-Benz range. A second-hand Mercedes-Benz Viano doesn't come cheap, but it more than makes up for it with its capabilities. Many people questioned Mercedes-Benz' foray into the MPV market, but they were resoundingly shushed when the finished article entered the stage. This is a comfortable vehicle that disguises its size with an array of sleek features. Both a 6-speed manual and 5-speed automatic gearbox variants are available, and special editions are regularly featured on the used marketplace too. In particular, the X-CLUSIVE and sporty Avantgarde are great choices, though the X-CLUSIVE is quite rare. Parts are cheaper than other Mercedes-Benz vehicles too. The van carries between 6-8 passengers in comfort, while also providing space for luggage. You can rearrange or remove the seats to create more luggage space too! A used Mercedes Benz Viano has rear-wheel drive, chunky brakes and dynamic handling features, which ensures a smooth drive. 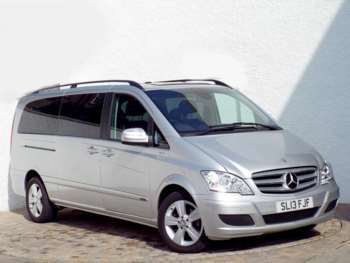 It combines practicality, performance, and great aesthetics, resulting in an MPV with a distinctly Mercedes-Benz flavour. Got a specific Mercedes-Benz Viano model in mind?